Connors Research, the research affiliate of TradingMarkets, has been developing, testing, and publishing quantified trading strategies since the mid-1990s. During that time, we have had the opportunity to evaluate a great number of different technical indicators and to assess their effectiveness in predicting future price action. The 2-period RSI is used by thousands of traders around the world. In fact, it’s considered by many to be the single best indicator for Swing Traders. Over the past decade professional equity, ETF, and options traders have learned to rely upon the 2-period RSI as their main indicator before they make a trade. Now we’ve taken the next step and created ConnorsRSI. 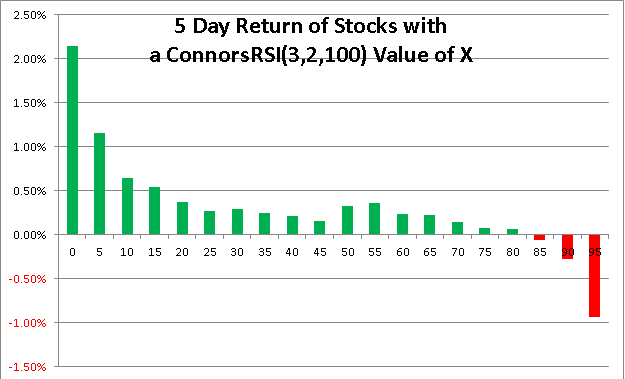 ConnorsRSI is a composite indicator consisting of three components. Two of the three components utilize the Relative Strength Index (RSI) calculations developed by Welles Wilder in the 1970’s, and the third component ranks the most recent price change on a scale of 0 to 100. Taken together, these three factors form a momentum oscillator, i.e. an indicator that fluctuates between 0 and 100 to indicate the level to which a security is overbought (high values) or oversold (low values). The chart below shows simulated historical research results from this strategy from 2001 and has been updated through February 2014 in the 2nd Edition! Since its publication, ConnorsRSI has been used by tens of thousands of traders worldwide and is available on major trading platforms including Bloomberg, ScottTrade, MetaStock and TradingView – and more platforms are being added. For your convenience, we also offer ConnorsRSI add-on module code for AmiBroker, MetaStock, thinkorswim and TradeStation. You can request links to download that code here. Please use the form (at the bottom of this page) to download your copy of the ConnorsRSI guidebook with our compliments. We hope you will find ConnorsRSI to be helpful in your ongoing efforts to improve your own trading results. 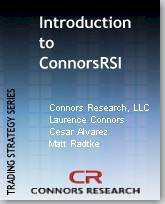 Please Use This Form to Download Your FREE Copy of Our ConnorsRSI Trading Strategy Guidebook. Updated Historical Results through Feb 2014!